Well it looks like Amazon has only paid £1.3M UK tax, based on turnover of £Sqillions. Much wringing of hands and cries of “Something should be done!”. The same goes for Google, Starbucks or any other international company doing well in the UK. But nothing is being done to solve the problem, and for various reasons depending on your economic policy outlook. First off, it’s not true to say Amazon pays very little tax in the UK. It pays VAT and PAYE. Lots of it. What it doesn’t pay much of is corporation tax, which is the tax on profits. And if you were an international company, you wouldn’t either. For international companies, corporation tax is, for practical purposes, optional. Companies may opt to pay as much or as little as suits their purpose. If this is news to you, it works like this: Take Starbucks, for example. They managed to make very little profit in the UK. Because of this they were paying little or no corporation tax, which may seem odd when consider their ubiquitous presence in the high street. The reason was simple: Starbucks in the UK bought its coffee from its Dutch operation and the price was so high it wiped out the profits here. In Holland they were minting it, selling coffee to the UK, but the Dutch government took a liberal view on how much tax it should pay on these profits. Basically they were allowing Starbucks to pay a cut of what should have been UK corporation tax, and trouser the rest. If Starbucks can do this simply by finding a foreign government prepared to sell out for a share of the profits, how easy is it for a Internet company with no physical product? Basically, corporation tax would be a farce, were it not so serious. The problem is that it’s still paid in full by our local companies, putting them at an obvious disadvantage to foreign competition. It does more damage than good. The left-wing idea is to make more new law against tax dodging. Somehow. And if international companies don’t like it, they can take their jobs, investment, VAT payments, PAYE payments and business rates and go somewhere else (e.g. Ireland). They’ll be gutted. Back in the real world, if you have an unenforceable tax that damages local companies the smart thing to do is abandon it. But there is a problem with this – how do you make up the revenue you’re currently collecting from UK businesses (those that remain)? The obvious answer, and one the Conservatives won’t stomach, is to raise personal income tax. This isn’t actually a problem, because foreign companies will just have to cover it to keep take-home incomes stable (or lose staff) and local companies can afford to give everyone a pay rise out of the money that would have gone in corporation tax. Levelling the playing field won’t be painless in the short term, but this no reason to avoid it. So Labour has a busted ideological plan and the Conservatives would be annihilated if they raised taxes. Something needs to break the deadlock, because newspapers naming and shaming global companies that are simply playing by the rules we gave them is no answer. Labour banging on about alleged “tax cuts for the rich” isn’t going to help. Neither will Conservative pledges not to raise any taxes. It’s not a question of raising or reducing taxes, it’s a question of balancing them properly. Meanwhile the Irish government is laughing at us, all the way to the bank. This isn’t the first time sellers like this have appeared, and it won’t be the last. However, this time I’ve reported it to Amazon and I intend to time their response. How could they let some fraudster list nearly quarter of a million items without anyone checking? The seller does have a business address in California, but I suspect this is fake too, and the name and address may well be a legitimate company. Mail order fraud is nothing new. There’s the apocryphal story from the 1950’s, and probably earlier, of the newspaper advert for Ever-lasting Slug Killer, “guaranteed to kill slugs indefinitely”. Respondents received two rocks, with instructions to place the slug on the first one and hit it with the second. Consumer protection laws in the 1970’s and European distance selling regulations have rendered this kind of scam difficult. If the product you deliver isn’t what it’s cracked up to be, or even if it is, the purchaser has the right to reject it when they see it. Therefore there’s no point in delivering tat; you might as well not send anything. Ebay has been plagued by such scams, and there are now plenty on Amazon too. To combat this, Ebay has policies that mean if the buyer complains, the seller doesn’t get the money. This has lead to the reverse-scam, where bogus buyers order something and then claim it didn’t arrive, and this has put a lot of sellers off using Ebay. Amazon has a similar dispute resolution procedure, but in my experience, has a team of people with functional brains who can tell the difference between a wrong’un and a victim. Eventually. You can see two common forms of scam on Amazon: Crazy price and Non-delivery. Set up as a seller, and pretend to be somewhere like China – long distance shipping. Find big-selling products and list them yourself, but at a slightly lower price than the other sellers. Wait for the orders to roll in, and then delay. Firstly, don’t ship immediately and then when you do, set as long a delivery window as allowed. Run off with the money. This works because of step 3. Amazon doesn’t allow you to report a seller when you spot something merely suspicious, so they can keep selling stuff for several weeks before Amazon has the chance to investigate. The complaints procedure only allows you to report non-delivery AFTER the last date specified by the bogus seller when they ship it. The thing is that bogus sellers like this are possible to spot before this. The extended delivery time is a first warning, and you can then research the range of products sold and how plausible it is that they’re cheaper than anyone else for the same product. Picking the cheapest supplier is a perfectly reasonable thing to do, especially when there are several scammers offering similar prices for fast moving items. Who would check further? The other scam involves putting small items on at a crazy price, often a hundred times their real value. It’s quite conceivable that someone in a hurry wouldn’t notice they’d bought a small item at completely the wrong price. I’ve been noticing these sellers for several years, and out of public spirit, I’ve reported them to Amazon staff and they’ve disappeared shortly afterwards, with a note thanking me for bringing them to their attention. Having never fallen foul of a crazy-price scammer, I don’t actually know how the problem gets resolved if you do buy something. Under contract law, if you’ve agreed a price and they’ve delivered your picture hook for £120+£50 delivery, you don’t have a claim. I see nothing Amazon can actually do about this, other than refund the buyer out of its own pocket and strike the seller off. Amazon’s lawyers may have something more creative. However, even if the scammer only has one sale before being shut down, if that nets them £200 it’s going to be worth it. As for the non-delivery scam, I don’t know how possible it is for the criminals to get away with the money. Amazon can’t hold on to it indefinitely, and will have to hand it to the seller at some point. Even if Amazon holds it until the latest delivery date, people aren’t going to flag it as fraudulent immediately – especially as the latest delivery date could be months later. It ought to be fairly easy to spot these bogus sellers automatically by heuristics, and it’s high time Amazon put some effort in it. Perhaps they’re making so much money they’d rather write it all off. Now I don’t remember reviewing E. Nesbit’s classic, and I prefer her Barnstable series anyway (although I doubt it’d be PC enough to make in to a film, so its merits are less widely appreciated). So what’s going on here? And I certainly don’t remember reading “The Ugly Duckling”, illustrated or otherwise. And then I realised – this was my daughter using a Kindle attached to my account. 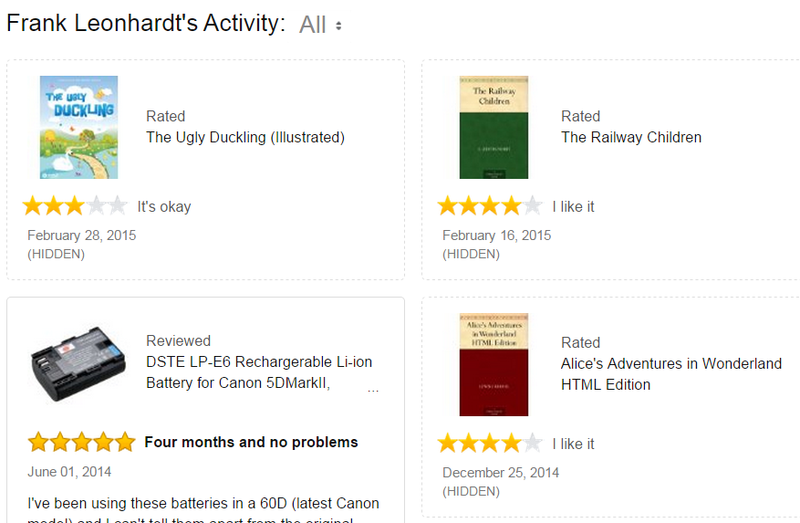 It appears that it’s possible to rate books from it directly, and this she has obviously done. In my name. Her pronouncements as to their literary merit may be valid, especially for someone her age, but this needs to be made clear. I’ve sent some pointed feedback to Amazon on this point, and will wait to see what happens. Me: Item arrived in poor quality packaging from Amazon (direct). Badly squashed – product box was 2″ high, Amazon outer only 1″ high. CD with driver software in same box as product visibly damaged and unreadable. Can’t tell if product itself is okay but appears unbroken. Amazon Rep: Hello, my name is *****. I’ll be happy to help you today. Amazon Rep: I am sorry for the condition in which your order arrived. Me: It’s hopeless packaging. It was squashed and the CD bent around the scanner – wrecked! Me: I ordered this direct from Amazon because I thought it might be better supported than the others available. Do you have the software available for download? Amazon Rep: I see that you have placed order for this scanner with the seller ‘M&S’ and it is ‘Fulfilled by Amazon’. Me: ’twas definitely in Amazon packaging. Amazon Rep: Yes, the order is fulfilled by Amazon. Me: Did the steamroller go over it before or after you posted it? Amazon Rep: This item was labeled ‘Fulfilled by Amazon’. 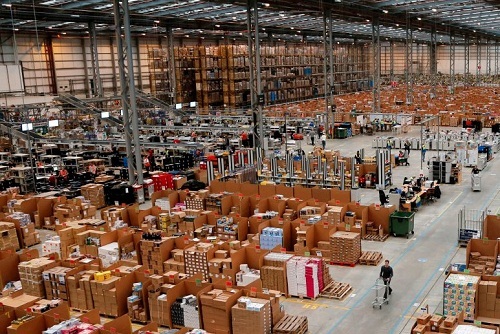 Items labeled ‘Fulfilled by Amazon’ are sent to you directly from an Amazon.co.uk Fulfillment Centre. Me: Thanks – I know – that’s why I chose to get it from you as your delivery is generally hassle-free. But this doesn’t help with the mangled CD. Fortunately the scanner itself is made of ABS and designed for grease monkeys to drop it so it looks like it survived. But it’s just a brick without the CD. Amazon Rep: Unfortunately, we are unable to create a replacement order for the items that are fulfilled by Amazon. Amazon Rep: Could you please return the item for a full refund? Me: No. I just want the software. If you’d like to pick it up subject to the distance selling regulations 2000 you’re welcome to do so – and I’ll tell warn everyone else about this crazy policy – but the software would be preferable for all concerned. Amazon Rep: Could you source the software CD from your local store? Me: Alas not, it’s not got any makers name on it, or that of the manufacturer. It’d make more sense to download it but there’s no clue as to who made it. Amazon Rep: If you can source it from your local store, I can issue a partial refund. Amazon Rep: If you wish to receive a full refund, you’re welcome to return it for a full refund. Me: Distance selling regulations – you have to collect it if you want to go the refund route. Are you based in the USA? This is a European sale. Amazon Rep: We will waive the return shipping charges, Frank. Me: No, sorry, you won’t waive any shipping charges as you’re not allowed to make any. According to the Distance Selling Regulations you are required to send someone around to collect it at your expense. All I need to do is hand it over. But I’d much rather have the software. Me: Please can you just tell me who produced (or sells) this thing, I’ll go to the web site and download it. Amazon Rep: The manufacturer of this scanner is ‘SainSpeed ‘. Me: Okay – thanks I’ll check the SainSpeed web site. Amazon Rep: I am sorry to hear about this, Frank. Me: I’m flabbergasted. I thought Amazon was a safe place to buy things! Amazon Rep: This is not a common occurrence, Frank. Amazon Rep: We value this kind of customer feedback, as it helps us to provide the best possible service. I will forwarded your comments to the relevant department here. Me: Okay. Is there any way you can get me a disk? if not, can you swap out the complete package? Amazon Rep: Unfortunately, our system will not allow us to create a replacement order for the seller items, Frank. Amazon Rep: If you prefer, you can return the item for a full refund, Frank. Me: If you want to pass this on to the seller (if you reckon it’s not you) then please point me at them. Visa reckons it’s you (this is also governed by the Consumer Credit Act). Amazon Rep: I understand your concern, Frank. Amazon Rep: I am sorry for the inconvenience caused. Amazon Rep: You have placed this order with the seller ‘M&S’ and it is ‘Fulfilled by Amazon’. Me: So what am I supposed to do? Wait for you to collect this one and order another one? Amazon Rep: In this case, I request you to return the item for a full refund. Amazon Rep: Could you post it? Me: Okay – you’ve got the address. Come and collect it. Meanwhile I’ll get Visa to recharge the value to my account. You contract was with Visa. Visa will pay you when the contract is fulfilled. I won’t pay Visa until their contract with me is fulfilled. Okay? Me: So when do you want to pick it up? Amazon Rep: In order to resolve this issue, we need to talk to you via phone. I will be happy to connect a call for you. Amazon Rep: May I know your contact number? Me: I’m on the ‘phone to one of your friends! Amazon Rep: Thank you for chatting with Amazon.co.uk. We hope to see you again soon. Have a Great Day! So, buying something from Amazon isn’t any guaranteed they’ll sort out any problems – even if their packaging is the problem. The subsequent telephone call went down the same route. I insisted on getting the software, not messing about with posting it back to them. Eventually they gave me the ‘phone number for this mysterious supplier: 0845-609-0200. I wouldn’t normally list a ‘phone number here, but a quick check revealed that it was the widely published customer service number for Marks and Spencer! I was skeptical, and queried this and asked where the number came from but they insisted that it really was the Marks and Spenser selling through Amazon. (The nature of the device – a diagnostic interface – is highly suspicious). I’ll call Marks and Spenser tomorrow. It could be interesting. Amazon isn’t off the hook buy a long way. Amazon has just launched a Kindle for £89 in the UK, beating the price of its previous model by £20. It’s 30% lighter and 20% smaller too. This is no big deal: they’ve simply chopped off the alphanumeric keyboard and replaced it with a few buttons, removed the audio playback and cut the battery size in half. I don’t think much of it. The original Kindle at £109 (£149 with 3G) looks well worth the extra. In the US, Amazon has launched additional models: Kindle Fire and Kindle Touch. The Touch dispenses with all keys in favour of a touch screen. It comes with or without 3G and is clearly intended as the new standard model. The Kindle Fire isn’t a Kindle at all – it’s a 7” Android Tablet. I’m not impressed. They’re using the Kindle brand to flog a fairly standard tablet. I’m sure it’s a fine Android tablet as Android tablets go, but a colour version of the Kindle e-book reader, it isn’t. It’ll rip through batteries at the same rate as every other tablet, and its colour screen will be just has hard to read in bright sunlight – the two problems overcome by the original Kindle’s e-paper display. Comparing the Kindle Fire to the iPad2: well it’s half the price but lacks the cameras, and has only 8G of storage. It’s also Android rather than iOS (if that matters to you). And it’ll probably be about the same price using Amazon’s exchange rate; and a lot more expensive than other Android tablets already available. One distinguishing feature is the new Amazon browser – Silk. Whatever else it does, it’s designed to work with Amazon’s cloud servers to cache content and “speed things up”. Hmm. Sounds like Phrom’s notorious Webwise system all over again. Okay if you don’t mind Amazon data mining your web traffic. Another strange feature is the pricing. The Touch and Fire aren’t available in England yet (the US launch is set for 15th November, no date for here). The US prices for all Kindles are substantially lower. (Note that the original Kindle has been renamed the Kindle Keyboard). The figures in brackets are my calculation, using Amazon’s astonishing exchange rate of $1=89p. All this talk in the UK media about these new models being cheap is overlooking this point. It might explain why Amazon isn’t launching the Fire in England any time soon.